We generally ship within 24 hours most of the year. To confirm your shipping time, you can email or call. Estimated deliver time will be posted once your order has been placed. Please note - Fed Ex does not count Saturday and Sunday as deliver days. If you are ordering on Friday or Saturday via Fed Ex, your order will not be shipping until Monday. In this case we suggest Express Mail. We have been shipping orders for over 20 years and we assure you that you order will be handled with the utmost care. 1. Fast & Free Shipping - All qualifying orders over $70 or more ship absolutely FREE via Priority Mail - No codes or coupons needed! 2. Free Gift Box - A complimentary Premium logo gift box with every jewelry order. Items over $200 include a Jewelers DELUXE Presentation Jewelers box. 3. Free Premium Gift Wrapping and Gift Message - We don't just tie a bow on our jewelry we use Premium Glossy Gift Papers, bows and ribbons and top it all off with a shell. These gift services are available on ANY order whether it is $20 or $2000 (see photo above for actual gift wrapping). We will even print out a personal message from YOU! Available at checkout or you can add to your cart now HERE! 4. Fast Reliable Shipping - Your order shipped out within 24 hours by Priority Mail, Express Mail Or Federal Express. Some Items can ship Same Day if ordered by 2PM EST. 5. Certification Card Included - With our 30+ year reputation, we certify each and every piece of Sea Glass Jewelry stating Quality value, Color and rarity Value. We will even include the location the piece was found AND the possible origin just like you see on our site! Over 600 READY TO SHIP online items! NEW PIECES ADDED EVERY DAY UNTIL 12/20. More items than any other site and each individually photographed and described! The EXACT item you see online ship to you! 8. A Full Time Professional Company - With over 20 years Online Experience! ....We're the oldest online Full Time Sea Glass Jewelry company on the internet providing exceptional service and products. Sea Glass is what we do! We have 100's of returning customers and over 1000 recent reviews from ACTUAL CUSTOMERS! (see our Real Customer Reviews - powered by Yotpo). Shop with Confidence - Our site is totally secure with top notch security! Shop Sea Glass Jewelry NOW! Don't forget to add our Premium FREE Gift Services available at checkout! If you need your order rushed shipped, please email info@bytheseajewelry.comor call us and we will be happy to get it out the SAME DAY! (if ordered by 1 PM EST). Please take advantage of our Premium Gift Services at checkout. Shipped to you or Direct to a gift Recipient. You can always email or phone us with any questions you may have. Each piece of jewelry sold on this site is one-of-a-kind and your order will be pulled from stock for a final cleaning and polishing. Our jewelry will then be carded and packed for shipping. Your item may not appear again online until it has been marked sold. If you do NOT receive your order in a timely manner, you need to contact us so that we can start insurance claims. What Method Can I Choose For Shipping? 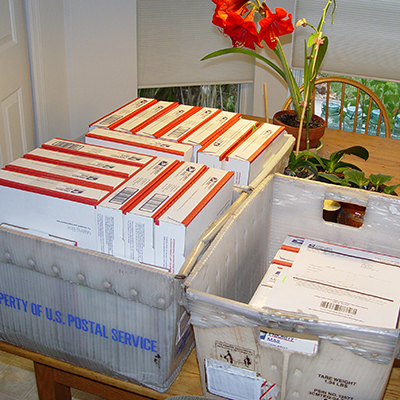 Express Mail generally takes 1 day, but can take 2 days if shipping to rural areas. Fed Ex Offers Overnight Options, 2nd Day, and Express Saver. Delivery time varies by option. Please keep in mind that Fed Ex does not consider the weekend in their delivery times so, for example, an order shipped Overnight Fed Ex on Friday,will arrive on Monday NOT Saturday. You can contact us for Saturday delivery of Fed Ex but the pricing is very costly. We do not ship Fed Ex on Saturday and Sunday (For Overnight Shipping on Fridays, use Express Mail (though this is not guaranteed to arrive unless extra fees are paid). Our Standard FREE SHIPPING is via Priority Mail. During certain times of the year, we do offer shipping specials. For the general public, this discount amount will be reflected on the shipping page. Free Shipping DOES NOT apply to repairs (past 30 days) or exchanges (anytime) or custom orders. Free shipping DOES NOT apply to Canadian orders. Custom Made Sea Glass Jewelry - Or jewelry altered to order specifications is not returnable but is exchangeable for 30 days and will be repaired at no charge if needed for 30 days.